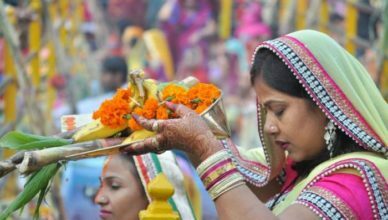 The popular Chhath puja is a Hindu Vedic festival celebrated in northern India especially in Bihar, Jharkhand, Uttar Pradesh. The ‘Chhath’ is a Bhojpuri word, signifies the sixth day or Shasthi and performed on the sixth day of the Karthik month according to the Hindu calendar, the Vikram Samvat. This year the festival will be celebrated on 26th October according to English calendar. The Chhath festival is dedicated to the Lord Sun and his wife Devi Usha and devotees appease them to grant wishes. Lord sun’s wife Devi Usha is known as Chhath Maiya or Chhatri Maiya, worshipped during Chhath Puja. Hindu Devotees believed that Draupadi and Pandavas performed Chhath Puja in the Mahabharata. Chhath Puja is a festival that worships the setting as well as the rising sun. People prepare the variety of traditional food on Chulha as a Prashad for puja of Chhath Maiya. Devotees also observe fast during Chhath festival for three days and open their fast on the day of Chhath puja after giving Aragya to rising sun. Chhath songs are ever popular and plays a significant role during Chhath Puja. People sing Bhojpuri Chhath Puja songs on this day while worshipping God. Here, we have few popular Chhath songs to play and listen during the Chhath festival.